Shelt Gill is a medieval cruck cottage with dry stone walls, modernised to make a cosy character holiday home. Smoking allowed. Children welcome from any age. Shelt Gill offers weekly bookings starting on Friday and short breaks of 2 days starting on any day in some seasons. Shelt gill is about 45 minutes' drive from jct 36 on M6. It is about 0.5 miles from Coniston village. A local map and directions are available on the website or by post. There is a train service to Windermere station but bus services to Coniston are infrequent. 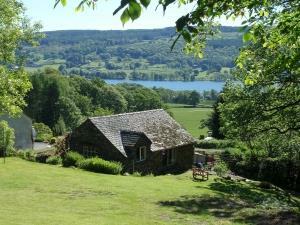 Sheltgill is a lovely cottage with beautiful views over Lake Coniston. Coniston is a very pretty small town on the edge of the lake. There is plenty to do with lots of walks and very friendly local public houses. The cottage itself is very comfortable and quite spacious for a family of four or five. It is very well equipped with a pretty garden.